Since the first installment of The Truth Will Set You Free podcast series titled “The Rapture Road,” Vic Batista of Miami’s Calvary Chapel Broward and Nathan Jones of Lamb & Lion Ministries have been teaching through the biblical prophetic book of 1 Thessalonians in a verse-by-verse study. We will now finish up our look at chapter one. Vic Batista: We are now going to encounter our very first verse in the book of 1 Thessalonians that deals with the message that Jesus Christ is coming back soon. Let’s look at 1 Thessalonians 1:9-10. Nathan Jones: Without the Son of God — the perfect man who came down from Heaven and died for our sins — there would be no worthy sacrifice that could pay the penalty of those sins and provide us with God’s forgiveness. Jesus Christ is both divine God and the perfect man combined. When Jesus died on the cross and was raised from the dead, the victory Jesus won over death became our victory over death as well. And, when we put our faith and trust in Jesus Christ as our Savior, we too can share in Christ’s victory. Vic Batista: How odd that today the teaching of the Rapture of the Church has been under attack. The teaching of the imminent, or soon, return of the Lord has fallen into disfavor. But, here Paul in chapter one was found waiting on God. The Early Church was always and anxiously anticipating that “today could be that day” when Jesus returned to rapture believers in Christ up to Heaven. Nathan Jones: First Thessalonians 1:10 is one of those great Bible prophecy verses. It tells us that a believer in Christ will be delivered from the wrath of God to come. Whenever the Bible talks about God’s wrath, it talks about how in God’s righteous anger He will one day punishment the evil nations of the world for their rebellion against Him. In particular, this act of wrath would be titled Daniel’s Seventieth Week, referring to a seven-year Tribulation time period that is still yet to come. That time period will see God pour out His wrath upon the world for their sins. But, believers in Christ are promised to be delivered from God’s wrath to come. And, 1 Thessalonians 1:10 is one of those verses, providing Christians hope that we will not be living on the earth during the Tribulation. Vic Batista: When we take the time and read through 1 Thessalonians all the way to chapter 5, and even with 2 Thessalonians, these two books are full of exhortations for Christians to keep looking forward to the return of Jesus Christ. What an amazing passage verse 10 is, for again we see God’s grace towards the Church through it! Paul by the inspiration of the Holy Spirit told us that believers in Christ are not appointed to the time of God’s wrath. It points out even that Jesus will be the deliverer rescuing us from His wrath to come. Often people have mistaken the term “wrath of God,” claiming the Tribulation must be meant for both unbelievers and believers alike, but that conclusion is not biblical. Nathan Jones: Correct. The Bible makes the explicit case that Christians will indeed endure persecution. Paul even states right there in his letter that the Thessalonians were enduring great persecution. Believers Christians will always face persecution because the world hates God and His moral law. And so, we are persecuted by man. We are persecuted by Satan. But, the Tribulation concerns the wrath of God, and God’s wrath is always poured out on the disobedient. As a matter of fact, Ephesians 5:6 says, “Let no one deceive you with empty words for because of such things God’s wrath comes on those who are disobedient.” Who are those who are disobedient? Those are the people who haven’t accepted Jesus as Savior and so still remain in rebellion against God. Vic Batista: The book of Revelation chapters 2 and 3 address seven churches. There we find in Revelation 3 a distinction made between those who are the earth-dwellers and those who make up the Church. These earth-dwellers are foretold to live through the time of the Tribulation. In the following chapters, we read about events that happen during the Tribulation, but the Church is not mentioned anywhere until they’re seen riding back to the earth with Jesus Christ. Nathan Jones: Jesus in Revelation 3:10 says, “Since you have kept my commands to endure patiently, I will also keep you from the hour of trial that is going to come upon the whole world to test those who live on the earth.” That promise also goes along with Romans 5:9, “Since we have now been justified by His blood, how much more shall be saved from God’s wrath through Him?” Also, in Colossians 3:4 we read, “When Christ who is your life appears then you also will appear with Him in glory.” So, there are many verses that go along with 1 Thessalonians 1:10 that gives the believer in Christ hope that, even though times are tough and persecutions are great, the ultimately worst time in all of human history — the Tribulation — for God’s wrath is not meant for Christians of the Church Age. Vic Batista: Praise the Lord! When we talk about the Tribulation we also know it as the Day of the Lord, and there are many other terms and names that describe God’s final exhibition of His wrath. Nathan Jones: Yes, other terms for the Tribulation include the Time of Jacob’s Trouble, there is also the Great Tribulation which refers to the second half, and as you mentioned there’s Daniel’s Seventieth Week. True, there are quite a number of different ways that the Bible describes the Tribulation. Most will recognize the Flood as the greatest example of God pouring out His wrath. The Flood was the outward manifestation of God’s wrath upon humanity since it had descended into great wickedness. God may have annihilated the planet with water, but He saved the righteous Noah and his family through it. Noah’s family was pulled outside of the floodwaters of the wrath of God, and so they were protected. So, too, the Tribulation is again about God’s wrath being poured out upon the world. And, once he has accomplished that act of justice, Jesus Christ will return to defeat evil and set up His Kingdom over the earth. So the Flood and the Tribulation are two major points in time where we see the wrath of God. And, here in 1 Thessalonians, we are told Christians will not have to endure God’s wrath. Vic Batista: The Bible makes it apparent that we do not have much time left to the Church Age. We really are living in those days that the Bible talked about which precede the Tribulation. You mentioned the Flood, and Jesus stated in Matthew 24 that, “As it was in the days of Noah so it shall be in the coming of the Son of Man.” In other words, we can clearly see that this world is as morally bankrupt as the time of Noah and Lot, and so therefore ripe and prepared for God’s wrath to befall an evil world. Nathan Jones: We live in a time period very close to the Tribulation. The signs of the times that Jesus gave us point to His soon return. We live in a time of increasing immorality and debauchery, very much like the days of Noah. God in his patience has been giving us centuries of time to repent, just like he gave an extra 100 years in Noah’s day for the people to repent. Eventually, the wrath does come, though, and I would not want to be an unbeliever — someone who hasn’t accepted Jesus as their Savior — and have to live through the terror that is the wrath of God. Vic Batista: That’s why we want to encourage people who don’t have a relationship with the Lord to seriously consider the fate of their souls. God has granted us the opportunity today to grab hold of God’s grace, like a life raft, so as to be able to escape God’s wrath to come. How can someone who hasn’t surrendered their lives to Jesus Christ as their Savior turn to the Lord right now? Nathan Jones: Turn to the Lord just like the Thessalonians did. They eagerly accepted the moving of the Holy Spirit in their lives. If you feel that there is a conflict in your heart, that means that God’s Holy Spirit is working in you. Jesus wants you to give your life to Him. Surrender your life by praying from the heart: “Dear, Jesus, please forgive me of my sins and be my Savior. And, Jesus promises that He will do just that. He will take away your sins. He will take away your guilt. Your sins will have been paid for by Jesus Christ, and you, therefore, can have the hope of a future in Heaven with you Father forever. Vic Batista: Thank you for joining us along the Rapture Road as we’ve begun our verse-by-verse study through the book of 1 Thessalonians. May the Lord bless you and keep you, may His face shine upon you. If you have accepted Jesus Christ as your Savior, we pray that you will have a wonderful and eternal life with Him! 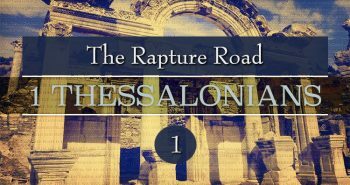 In the sixth part of our travels along the Rapture Road and our verse-by-verse study of 1 Thessalonians, we’ll begin our look at chapter two. Deb, sorry, not on YouTube, but the audio podcast is posted at the top of each post. Therefore, according to Scripture, the “wrath” which we’re “not appointed to” is the post-trib, post-70th week DoTL. Im sorry but your speaking of the second coming. If we are to be taken, harpotzo, and the bible says that people will be carrying on as usual…there will be nothing usual during the tribulation. Again, scriptures you give point toward the second coming NOT the rapture. During the rapture, Jesus will not come to earth. I read your words…. none of your words mention Revelation 6, 6th Seal toward Revelation Chapter 7…. Fifth Seal – Martyrdom – Fulfilled and Continue to Present. Soon 6th Seal will begin the great shaking in Heaven and earth just before Revelation 7 that Jesus Christ will be 2nd Coming to gather all of Followers and believers following Him with all of their heart. God answered my prayer by opening my eyes with understanding this Chapter 6 through 7 instantly after sought Him for over 20 years, I did read but could not understand until more than couple years ago. It is Mid Tribulation not Pre/Post Triublation… Seek Him for understanding not rely on another and their beliefs in Pre-Tribulation… Otherwise God won’t answer your prayer… I pray that you read and understand those chapters. Andrew, interesting interpretation! Hadn’t heard that one before. We place all 21 of the Tribulation judgments within Daniel’s Seventieth Week (7 years) in our teachings. Other one He led me in 1Cor 1:19-31, 2:1-16, it is incredible wisdom of God I understand, never stopping since 1997! I will look at your teaching – Tribulation judgment within Daniel’s seventieth week, not sure if I able to find it in your website. Let me know in case if I cannot find it. Bless you with my all heart in Him.